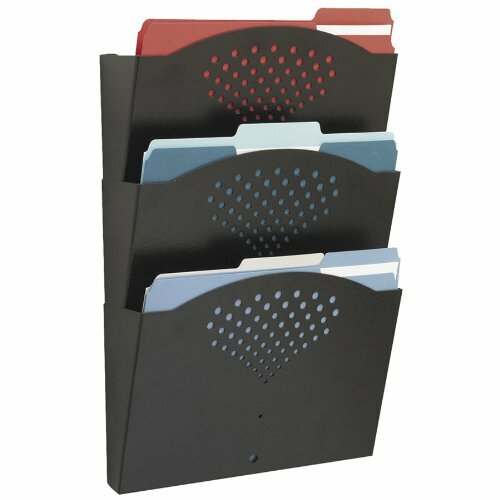 Safco Steel Three Pocket Wall Rack keeps your essential files, catalogs and documents visible, organized and within easy reach. Commercial-grade steel offers strength and stability while the powder coat finish helps reduce chipping or scratching for long-lasting use. Three 2" wide pockets with decorative accents hold letter-sized folders, cookbooks, journals, and binders. Mount it in offices, small cubicles, mailrooms, school rooms, hobby rooms, and communal work areas for a long-lasting workspace organization solution. Rack attaches flush to any wall and includes mounting hardware. STURDY CONSTRUCTION. Safco Steel Three Pocket Wall Rack keeps your workspace clutter-free by storing essential files and documents off your desk. Manufactured with commercial-grade steel to last for years of heavy, repetitive use. LETTER-SIZED POCKETS. Three 2" wide pockets with decorative accents make it easy to locate documents, catalogs, magazines, newspapers, files, and folders. LONG-LASTING QUALITY. Durable, powder coat finish helps resist chipping and scratching to look professional even after years of heavy, repetitive use. MOUNTS FLUSH TO WALL. Rack measures 12" x 3 1/2" x 17 1⁄4" and mounts flush to any wall with no assembly required. Mounting hardware included.